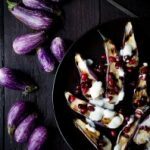 This Grilled Fairytale Eggplant with Garlic Yogurt Sauce and Pomegranate is an impressive, flavorful, vegetarian appetizer. Fairytale eggplant is one of those ingredients I like introducing to people who say they don’t like eggplant. Not only are they gorgeous but the skins are completely soft when cooked and there are no seeds. They’re like perfect little eggplant jewels. They’re gorgeous. 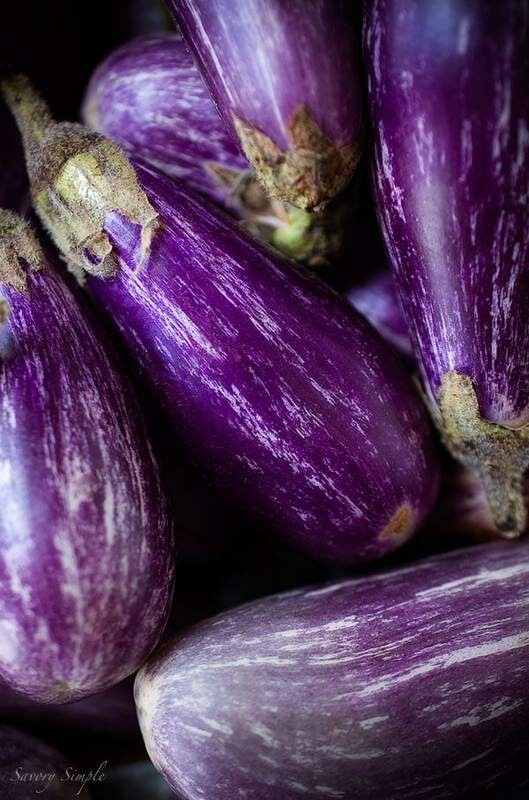 The easiest way to prepare fairytale eggplant is to simply roast it in the oven (which you can do with this recipe instead of grilling, if you prefer). The only negative to roasting them is that they lose a lot of their vibrant, natural purple tones. Grilling leaves some of that color in place and also yields a tastier dish. The grill adds a smokiness that you just can’t get from roasting. With regards to the yogurt sauce, I recommend using a full fat yogurt or at least one with some fat. Also, the longer the garlic and the yogurt sit together, the more noticeable the garlic flavor will be. The sauce can be prepared one or two days in advance. In a small bowl, stir together the yogurt, minced garlic, lemon juice and salt. Use milk to thin the sauce to the desired consistency and set aside. The garlic flavor will become more noticeable the longer it sits with the yogurt. Slice the eggplant in half lengthwise and sprinkle liberally with salt (you can slice the stem off first but I think it looks prettier attached, like poached pears). Place in a colander over the sink. Preheat a grill to medium-high for 10-15 minutes. Rinse the salt from the eggplant and lightly pat dry. Place in a large bowl and toss with just enough olive oil to prevent the eggplant from sticking to the grill. 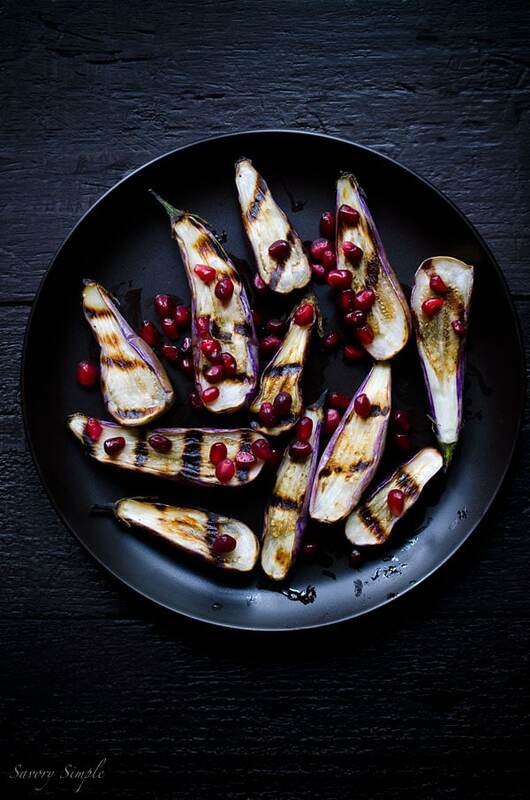 It is easiest to grill the eggplant in batches since they are small and don’t take very long. Place 10-15 eggplant halves on the grill, flat side down. Cook for 2 minutes and then flip them carefully with tongs. Close the lid and cook for another 2 minutes. Remove from the grill, cover with foil to keep warm and repeat with the remaining eggplant. 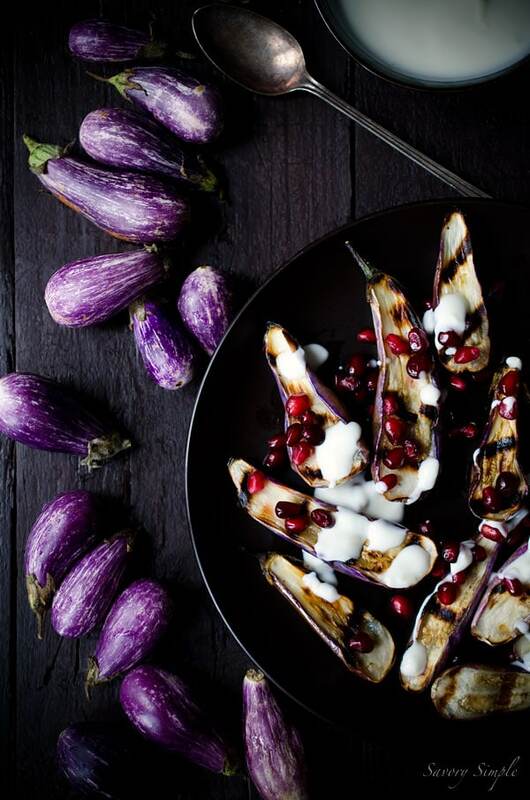 Just before serving, drizzle the eggplant with the garlic yogurt sauce and sprinkle liberally with pomegranate seeds. This dish! Pretty beyond words. 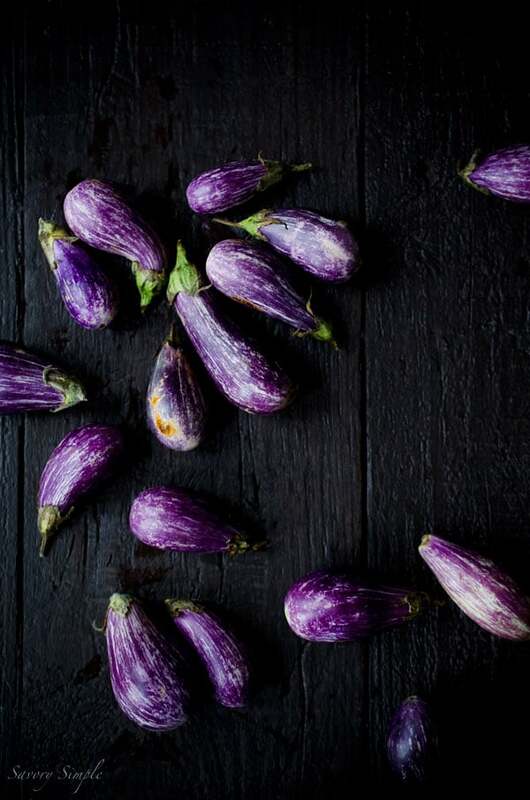 I love eggplant and these little fairytale ones are adorable! I would love this with the garlic yogurt sauce. Oh my goodness…this is just stunning! You captured those beautiful colors perfectly! I eat this combo for dinner all the time! Yours looks way prettier though. LOVE this! Beauty! Anything with eggplant and anything by Ottoleghi and I am there. I met him briefly at Food Blogger Connect in London and was totally star struck and he was ever so kind! Absolutely gorgeous!! I’ve never tried fairytale eggplant before. Can’t wait to hunt some down. This is so, so stunning! So many things to delight in it’s hard to know where to begin. But I love the addition of the garlic yogurt sauce!